Adopted by NATO in 1954, this exquisite round was used in two of the best rifles of the time, the M14 and the M60 machine gun. However, this round is still used today in more modern rifles, such as the FN SCAR and is nearly identical to the widely used hunting round, the 308 Winchester. Whether you are looking to defend your family, bag some meat, compete in a shooting match, or head out to the range and plink around with your buddies, the 7.62x51mm NATO is the round for you. 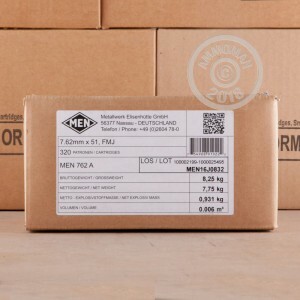 With their international acclaim, high quality manufacturing, and environmentally friendly waste disposal system, MEN is just the high bar company you need to buy from. 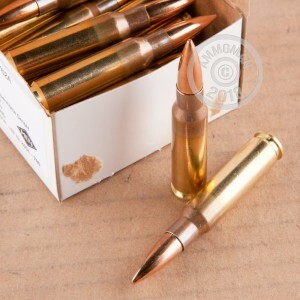 These 147 grain, full metal jacket, boxer primed, brass cased, cartridges are incredibly reliable, reloadable, and give you the accuracy you need to have a blast at the range. Great ammo at a great price! Free and fast shipping! Highly recommend and will buy from again!Thank you! All around a great buy for superb ammo! Shoots well and does not leave a lot of residue. Will definitely be buying more! Thank you! Bought 500 rounds of this as food for my first M1 Garand. My brother and I fired about 100 rounds of this stuff without any problems. We were getting 6" groups at 100 yds. I like this ammo, and would definitely buy it again! Good ammo for some needed range time! This was good ammo at a good price. I needed the brass for reloading but I found this ammo to be accurate and reliable in my M1A and my scout bolt rifle. I will purchase this ammo again. most rifles are ammo sensitive to some degree. Mine are no different, they each have their favorite with no seeming rhyme or reason. Having said that, this is one of two great rounds I will be stashing. 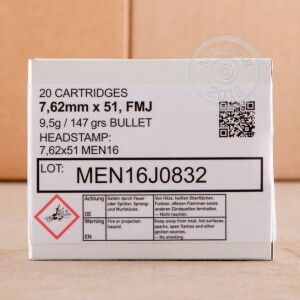 This is current production ammo head stamped MEN 16. The bullet is a 147 grn open base boat tail. This is superb milsurp ammo. However, it is not as good as the MEN 94 I had used previously that had a closed base boat tail bullet and was more accurate than Federal Gold Medal ammo. If you don't need match grade ammo, this is worth stocking up on. Arrived in time and very good ammo for the range! All around good experience . Have not sent any down range yet. Quality looks good.